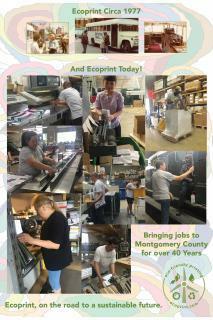 Creating Environmentally Sustainable Printing since 1977 - 100% Carbon Neutral. 100% Wind Powered. We consistently lead the industry in green standards and techniques; from our unwavering focus on investing in leading edge sustainable paper and ink to reducing our footprint through our use of 100% renewable energy and the systematic conservation of resources. Our mission is to lead the charge in helping to transition the paper and printing industries to a higher level of sustainability. Clients and partners choose Ecoprint because they demand excellence in service and because they want their projects to reflect their commitment to a greener planet.